but I'm beginning to catch the vision." ~ Jim Twamley, "Professor of RVing"
Since selling our house in June and living-traveling full time in our Cameo 5th-wheel coach, we've caught that vision and have been spending more time in the "slow lane" of life. It's wonderful! I wrote about our morphing lifestyle and thought processes in the last entry, including the desire to stay in some places for longer periods of time, having full hookups instead of doing so much boon-docking, and not feeling like we have to go-go-go all the time. Traveling is our life now, not a summer or winter "trip" from a home base. Our camper is our home. 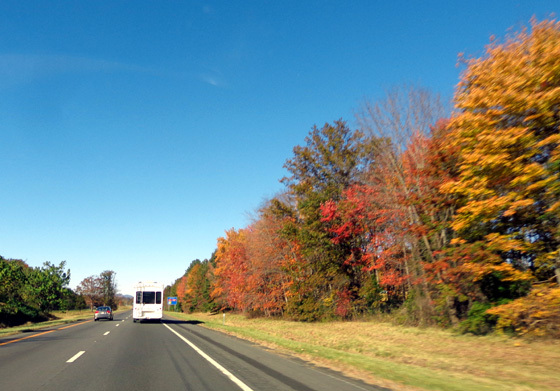 In this entry I'll talk about the rest of our snowbird migration as we continued to follow the fall leaf color from Andrews AFB near Washington, DC to Kings Bay Sub Base, just north of Jacksonville, FL. That's where we'll be wintering for several months again. We're back to driving two separate vehicles from Point A to Point B again, at least until we go to Alaska next summer. 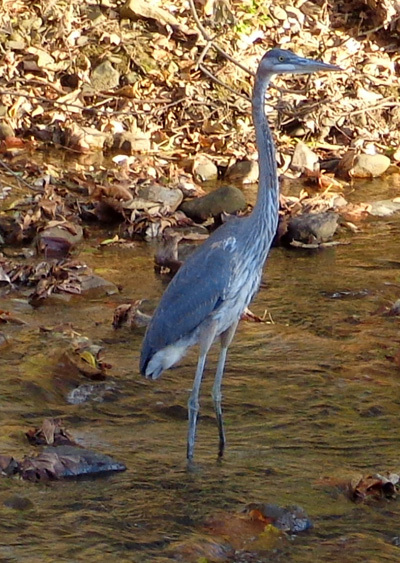 The first leg of this journey was from Andrews AFB to an RV park in Salem, VA, part of metro Roanoke. It was only the second time where I've driven our Honda Odyssey minivan behind Jim while he tows the Cameo 5th-wheel with our Dodge Ram truck. It'd be nice if I could lead the way so I could have a better view but that just isn't practical. We knew better than to even try it that way the first time. Because Jim can't maintain as steady of a pace on hilly roads with the RV as I can in a minivan, he needs to be in front. I can more easily adjust my speed to keep approximately the same distance behind him as his speed varies with the terrain. Jim wants me to stay closer in the van than I want to be, in order to prevent other vehicles from getting between us. However, it's safer if I have a better view in front of me -- and definitely more interesting than seeing only the back end of our camper for several hours! So I stay back a little farther. We plan to keep the van with us until we go to Alaska next summer. It will stay in a storage lot at a military base somewhere until we get back from that long trip (I guess going anywhere outside the Lower 48 we still consider a "trip"). 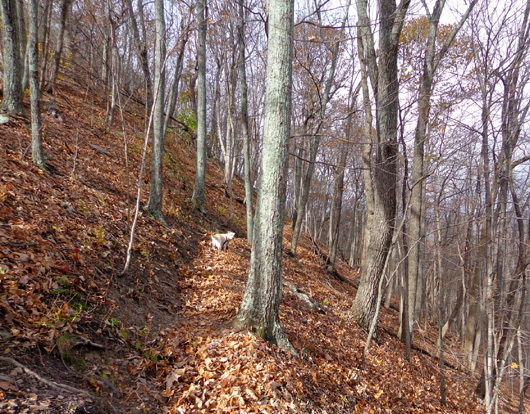 At higher elevations along I-81, the leaves were mostly gone already. The van is very handy to have when we're camped somewhere for several weeks or months at a time, like at Kings Bay this winter. It's cheaper to operate, easier to maneuver, more roomy for dogs and groceries, and more comfortable to drive than the diesel truck. It's in very good shape for a 2002 vehicle and we plan to keep it until it is no longer cost-effective. Meanwhile, there's still a learning curve when we're driving separately from one destination to the next. It would be similar, or worse, if we were in a caravan of other RVs, which is common for folks heading to Alaska. 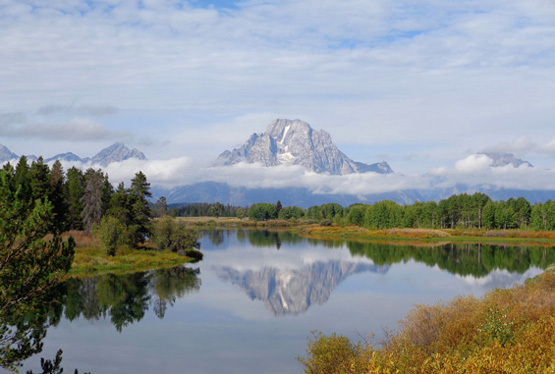 We've heard of groups of two to twenty RVs that travel together through Canada and Alaska for several weeks or months.. It's great when we have sites large enough to park both vehicles next to the Cameo. This is Kings Bay, GA.
Driving both vehicles in transit is still stressful, particularly in urban areas and particularly for Jim, since he's in the lead and has to make the decisions re: where to turn, which lane to be in for freeway exits, etc. without me sitting next to him, navigating. We can call each other on the phone but that's dangerous and I can't reach him right away if I realize he's made an error. In order to reduce incorrect turns we'll have to go over the exact route together before embarking, and scrutinize the turns on the GPS (we have only one GPS unit and. "Maggie" doesn't always send us the right way). It also helps if we both write down the directions. Those tactics helped make the drive from Virginia to Georgia more pleasant. We'll still have some split-second decisions, I'm sure. We assume this will get easier as we travel more. 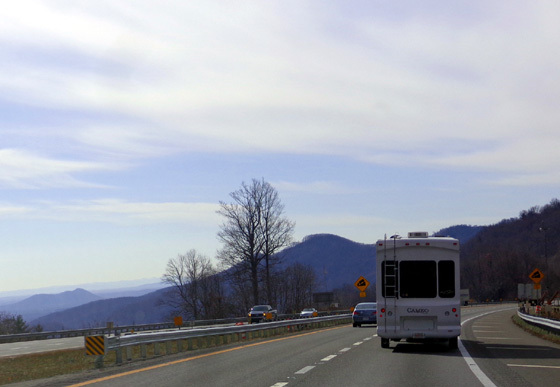 For some reason there are very few RV camping options in the Roanoke Valley, even in the summer, despite it being a very desirable vacation destination. 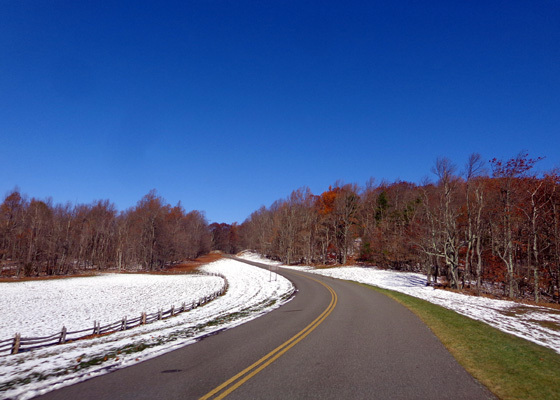 It's in a beautiful valley between the Blue Ridge Parkway and Appalachian Trail (A.T.), which are heavily traveled in the spring, summer, and fall. Hwy. 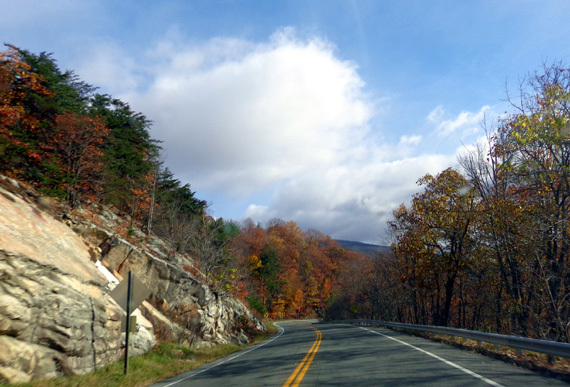 11 near Catawba Pass; we were fairly close to the A.T. in Salem. 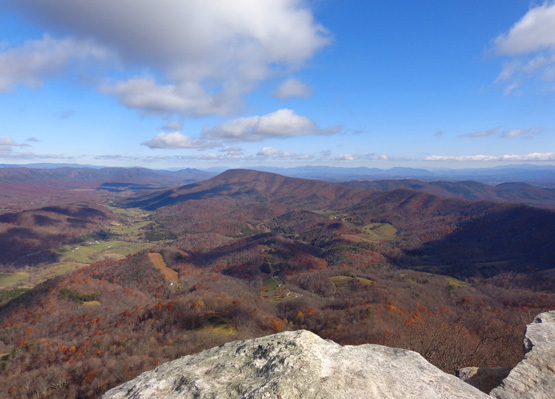 to Maine; it overlooks the Catawba Valley west of metro Roanoke. 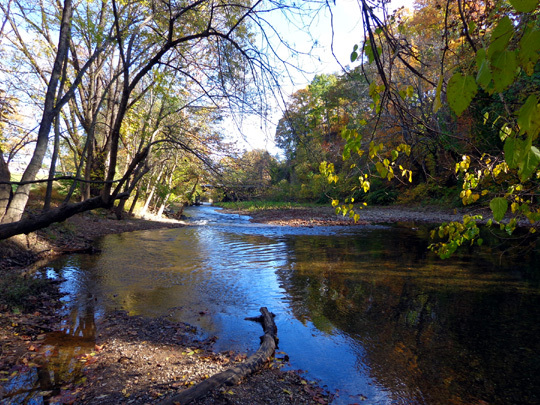 Off-season RV camping options are practically nil. We knew we wanted to spend at least two weeks in the area this fall for a variety of routine annual and semi-annual medical appointments with the practitioners we've been using for the last ten years but finding a suitable place to stay in the Cameo was difficult. Jim hit the jackpot when he found Salem Village on the internet. We had never seen the place before our arrival but it looked good online and from Google Earth. It's primarily a mobile home park -- a very nice mobile home park, with high standards for its residents. It has shattered our negative stereotype of mobile home parks, although there are still some ratty-looking ones in the Roanoke area. 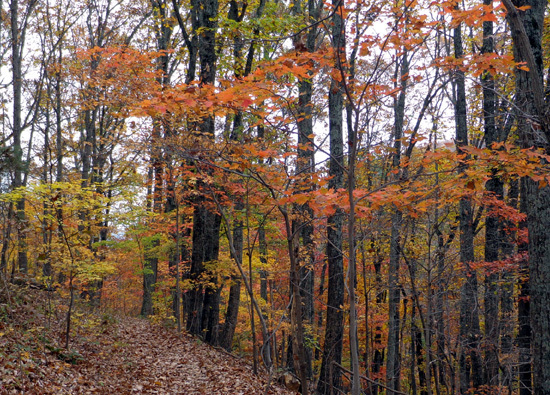 No leaves closer to the top of the ridge, though -- they're all on the ground now by Nov. 12.
the best colors are at lower elevations in the Roanoke Valley. Most of the "mobile" homes in the community look pretty permanent with sheds, carports, and nice landscaping but Salem Village wisely saw the need for more short-term RV sites in the area. 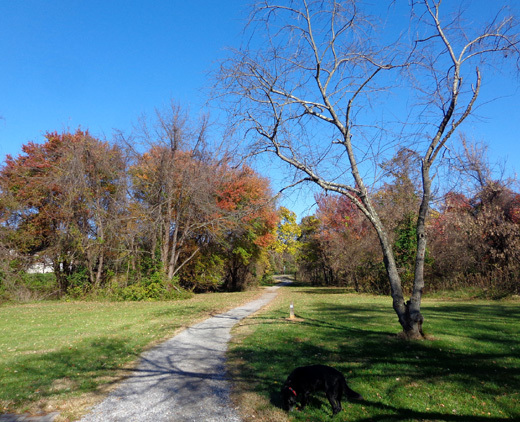 It has converted about a dozen former mobile home lots to RV sites. 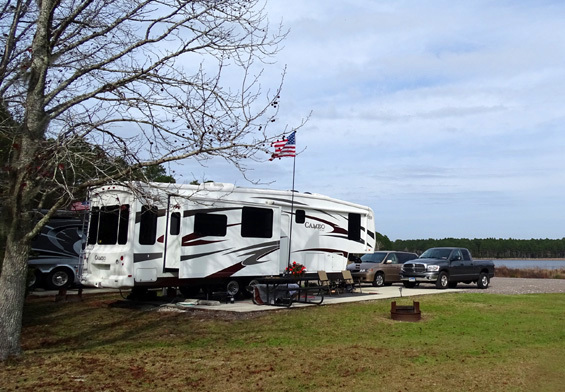 Some of the RVers stay for months or years at a time, too, though, so there isn't much turnover to allow folks like us to stay there for shorter periods of time. We got on a waiting list for a site several months ago but didn't know for sure until a couple days before our arrival that someone had left earlier than expected and we could have their site during the time period we requested. Whew! Our only other option was Dixie Caverns, which is farther out of town and not nearly as nice of a campground. 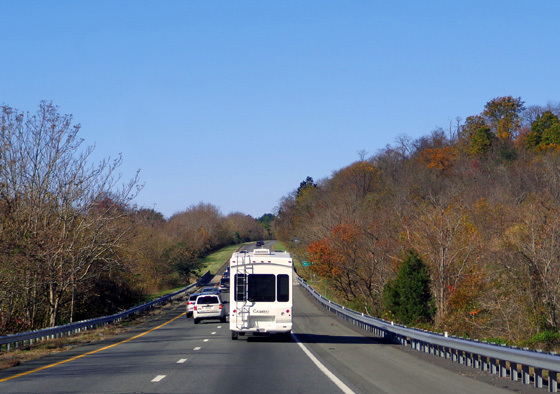 It's obvious that the Roanoke area needs more places for RVers, even in the winter. 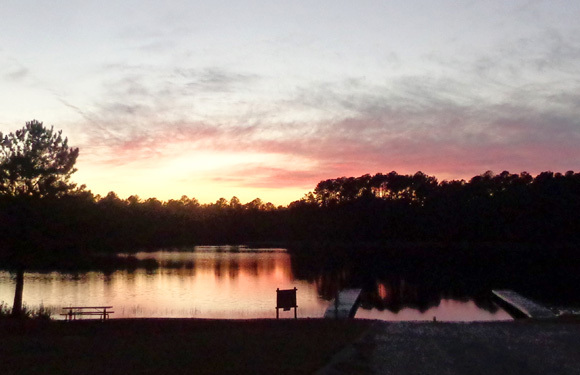 We enjoyed staying in this RV park/mobile home community for about three weeks. 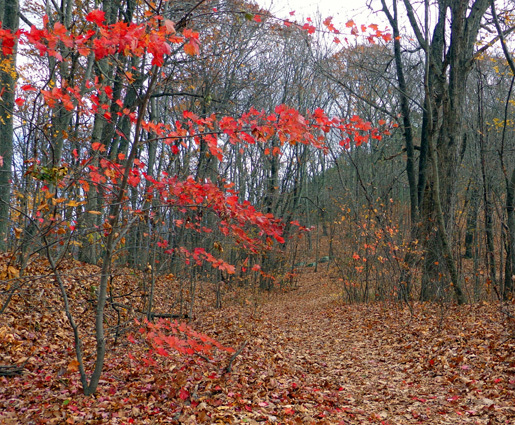 Salem is on the other side of metro Roanoke than our house in Bedford County was, but it's actually closer to most of our doctors, favorite stores, and hiking-biking venues. 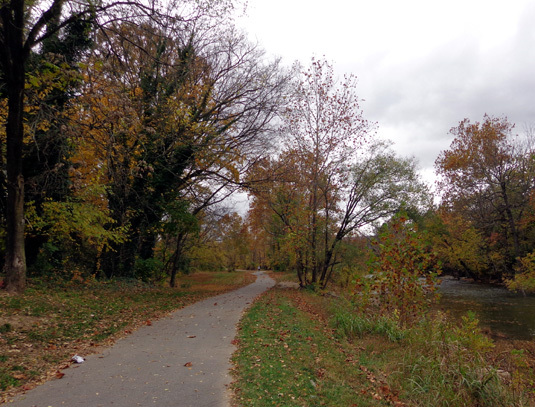 It was fun to learn about a new part of town (I've always considered Roanoke and its suburbs to be one city). Not only is Salem Village convenient and attractive, we also feel like we got a real deal. 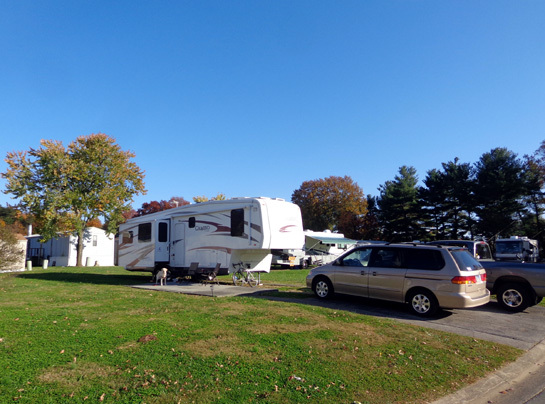 Our RV site with full hookups -- including powerful 50-amp electricity -- and a large grassy yard was only $375 a month. Even though we weren't there that long the daily average was still a bargain compared to some other places we stay. 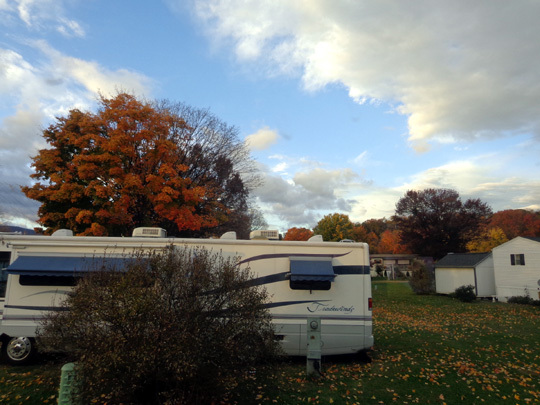 There was a very colorful maple tree on the other side of our neighbor's RV. By mid-November we were mighty glad to have 50 amps, too. 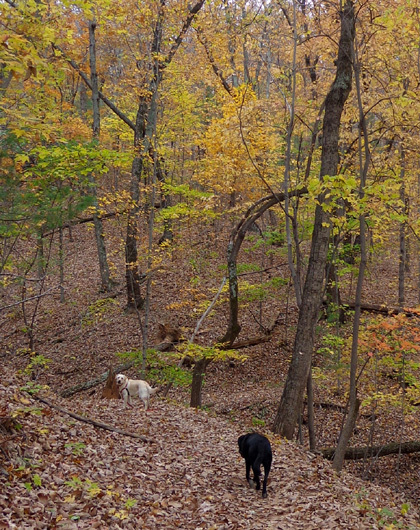 Temperatures were unseasonably cold the last week of our stay, dipping down to 20 F. some nights. We needed the amperage to run three small electric heaters to keep the camper warm. Two were directed under the kitchen sink to keep the water pipes from freezing, and we left the water dripping overnight. We have an efficient propane space heater and a rather inefficient gas furnace, but propane puts a lot of moisture in the air that we don't want inside. We much prefer to use the electric space heaters. Besides seeing our general practitioner, orthopedic specialists, dermatologist, dentist, chiropractor, and massage therapist?? Oh, and Casey's and Cody's vet?? It did seem like we had an awful lot of medical appointments but it was time for various annual and semi-annual visits, like our Orthovisc knee injections. It was just easier to do them all here than to try to find new practitioners in the Jacksonville, FL area this winter. It's probably the last time we'll see all or most of these folks. Although it will take more research and effort to find good docs as we travel full time, so far we've been fortunate to get good care on the road when we've needed it. 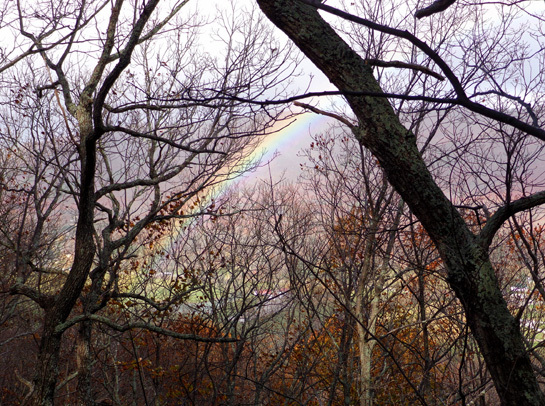 Light mist and sleet during that hike produced a beautiful double rainbow over Catawba Valley. We took care of some other business, like getting a few things from our storage unit and putting some other things into it. It could be years before we ever see what's in there again! Even though we recorded where most items were located, and took photos of the contents, we still had a devil of a time finding Jim's ham radio (finally did). We drove by our previous house, which we sold in June, but didn't have a good opportunity to look at it or the yard because the new homeowner was mowing the front yard close to the road and we didn't want him to see us. A ladder was propped up against the roof and piles of leaves were below it. One of Jim's least favorite activities when we'd return to the house in the fall was blowing leaves off the roof and out of the gutters. He had a big grin on his face when he saw the leaves, so happy he doesn't have to deal with them any more! And I'm very glad not to have several weeks of weeding to do. Funny thing was, our only reaction when we saw the house and yard was one of relief, not nostalgia for selling the place. It had come to represent a lot of work, not a retreat. In contrast, I was surprised when we approached the Roanoke area a few weeks ago and I got teary-eyed when I saw Tinker Mountain. 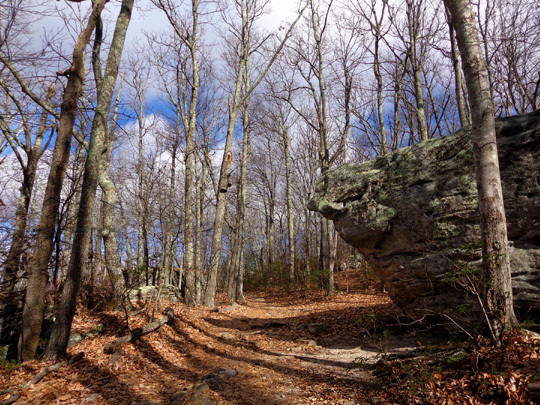 I have better memories of fun times hiking the Appalachian Trail in Virginia than I do of previously owning the nicest house and property there that I ever owned!!!! Interesting. And that's why I can say with certainty that I'm glad we finally sold it to travel full time in our RV. Ditto for Jim. 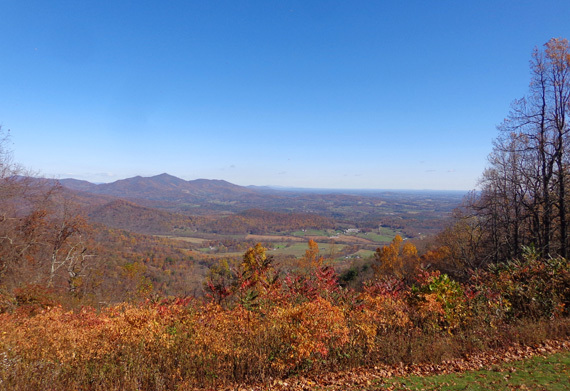 Between all the medical appointments, shopping, and other mundane activities we still had plenty of time for more fun things like hiking, cycling, and going on a day trip to my favorite winery along the Blue Ridge Parkway. Not only was Salem Village convenient to places we needed to go, it was also very close to several bike path trail heads where we could walk the dogs and go cycling. 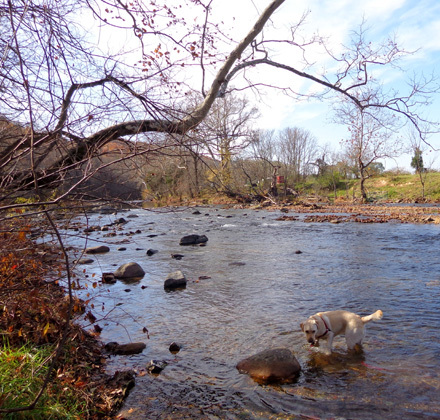 Even on cold or wet days I had to walk the dogs, and Jim rode his bike quite a bit. 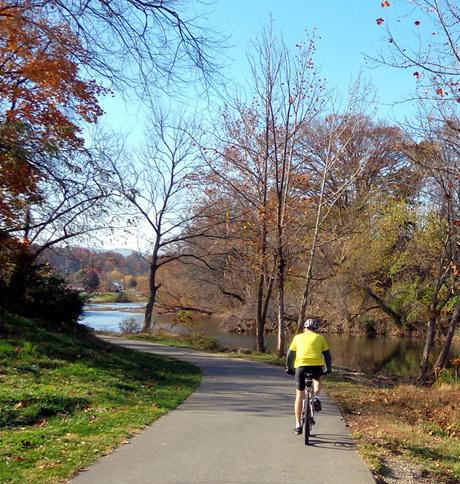 Jim cycles on part of the river greenway in Salem. in Vinton when we had property east of town. 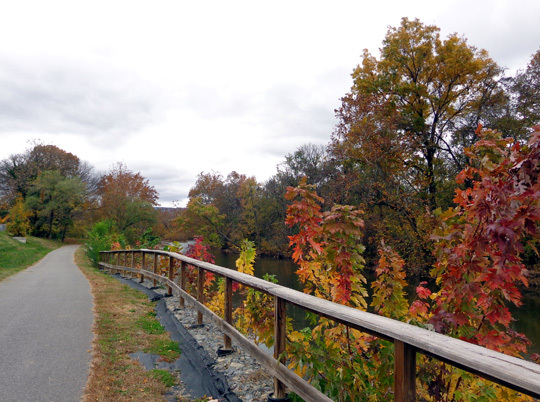 Photos in this entry show scenes from the Mason Creek bike path across the creek from Salem Village; segments of the Roanoke River Greenway in Salem and Roanoke; the Wolf Creek Greenway in Vinton; and Greenhill Park. 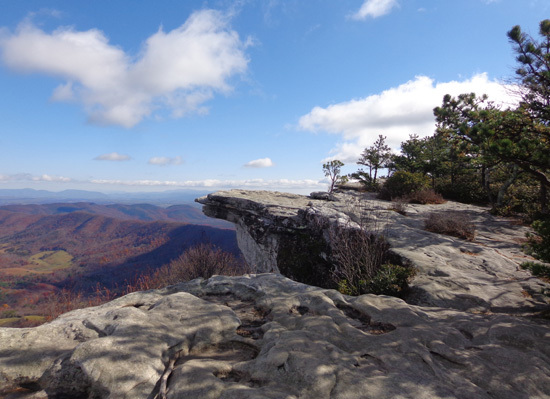 I also hiked two to ten miles on single-track trails a few times with the dogs, too, including Chestnut Ridge in town and two sections of the Appalachian Trail -- the ridge west of Catawba Pass and north of the pass to McAfee Knob. One sunny-but-very-chilly day in early November we drove south on the Blue Ridge Parkway to my favorite Virginia winery at MM 171. I've been buying Chateau Morrisettes's tasty and reasonably-priced wines at the WalMarts and Sam's Club in Roanoke the last 10+ years but had never visited their winery. 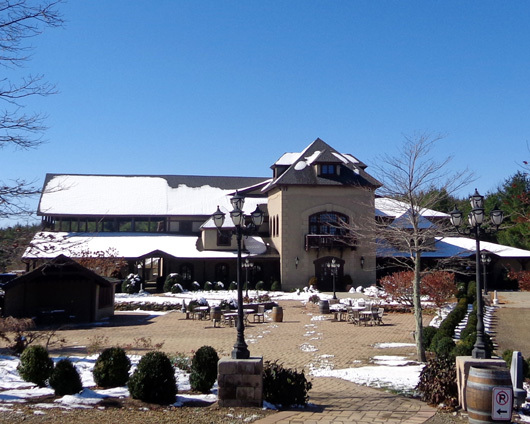 It's one of the larger of the 100+ wineries in Virginia and has a restaurant, tours, several festivals throughout the year, and daily wine tastings. Sam's Club and WM in the Roanoke area carry a total of about ten of Chateau Morrisette's wines. For the record, my favorites are Blackberry, Our Dog Blue (a semi-sweet Riesling blend), The Black Dog (a semi-dry Cabernet-Merlot blend), and the sweet white and red mountain laurel varieties -- but the winery's broad selection is all good and reasonably priced. At the winery I tasted some other flavors that I hadn't seen before and chose two of them to buy. I got a Red Farmhouse Sangria (listed under "fruit wines") for $7.99/regularly $10.99 on-site and a white Angel Chardonnay ($12.99 less military discount of $2.60). I didn't realized they offered a 20% discount to military folks until I was checking out. I should have gone back to get more of the wines I buy in Roanoke because they'd be cheaper with the discount than at WM or Sam's Club. Labs are the winery mascots and are featured on most of the wine labels. The winery encourages visitors to bring their well-behaved dogs onto the grounds and into the wine tasting/shop but we left ours in the car because of the weather that day. The winery sits at 3,500 feet elevation and it was COLD and windy there at noon. So were all the overlooks along the Parkway. 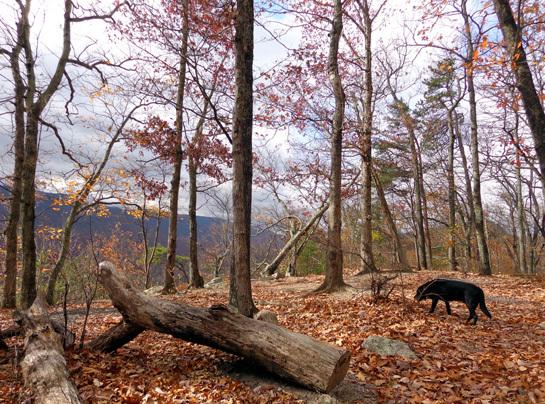 We were disappointed that most of the leaves had already fallen, even at 2,000 feet (they are still pretty in the valleys). Are you kidding me??? It's barely November!!! 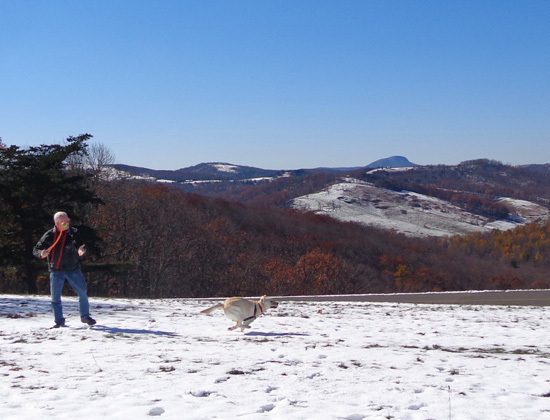 On the way back to Salem we stopped so Jim could play ball with Casey in the snow. Look at 'er go in the photo above. Both dogs love snow. The second leg of this journey was from Salem, VA to Kings Bay Sub Base in far southern Georgia. The weather turned very cold in the Roanoke Valley a few days before we left -- I'm talking an unseasonably low 20 F. overnight in November! -- but we weren't able to leave any sooner because of one last pending medical appointment. 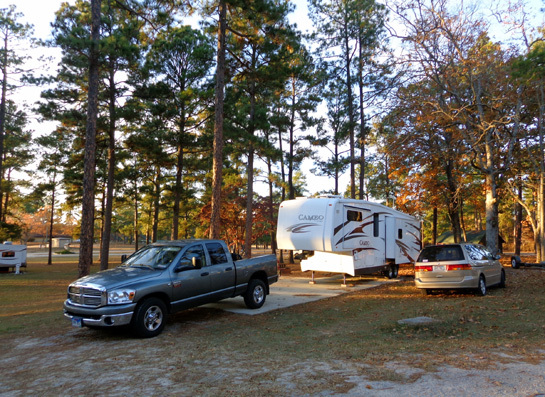 When we finally got going on November 19 we broke the distance into two days of driving, stopping at Fort Jackson's Weston Lake Recreation Area's very nice campground near Columbia, SC the first night. The rec. area is open only to the military and guests, not the general public. We're glad we didn't stop this time at the WM-Sam's Club parking lot where we stayed last year when driving this same route. We didn't know then about this option. It was dang cold in the Columbia area, too, and we needed the 50 amps of electricity we had at our site at Weston Lake to stay warm and keep the pipes from freezing. Because it was still in the 20s F. Jim didn't even hook up to the water or sewer for just one night. We really like the campground and rec. area and would like to spend more time there if we're ever in the area again. 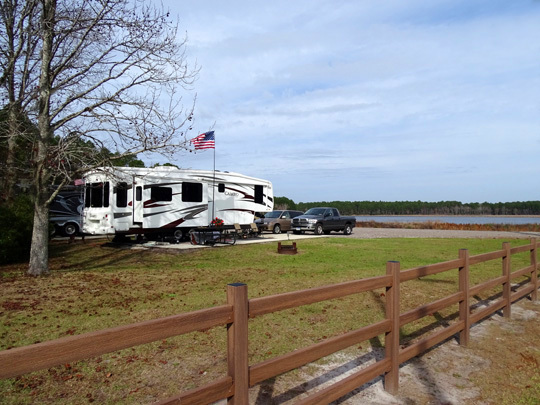 The campground has 44 RV sites with varying levels of utilities plus unlimited tent sites. 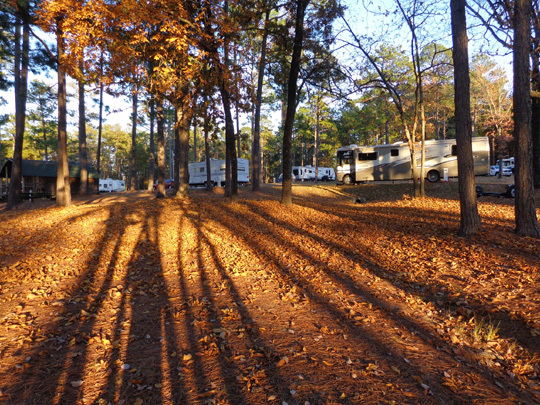 Each RV site we saw is spacious and shaded by large trees. Our cost was only $15/night for full HUs. There are also some cottages to rent and a pretty lake, which we could see from our campsite. The final leg of our journey to our winter snowbird "nesting area" was an easier, flatter drive through the rest of South Carolina and eastern Georgia to Kings Bay Submarine Base at St. Mary's, which is a stone's throw from the Florida border. This is our third winter at Kings Bay. It's good to be back. 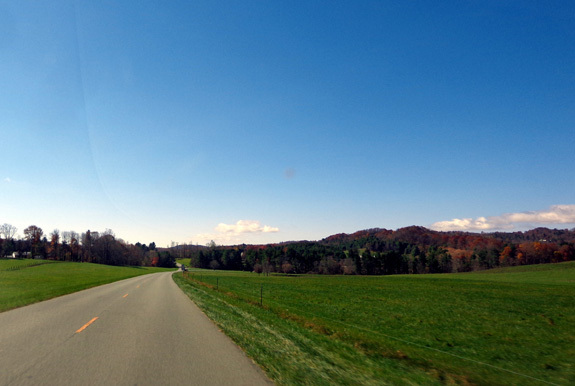 It felt more like "going home" when we arrived today than Roanoke, where we owned a house and land for ten years. Oddly, some other places feel more like home than Roanoke, too -- most are in Colorado, where we often spend the summer. 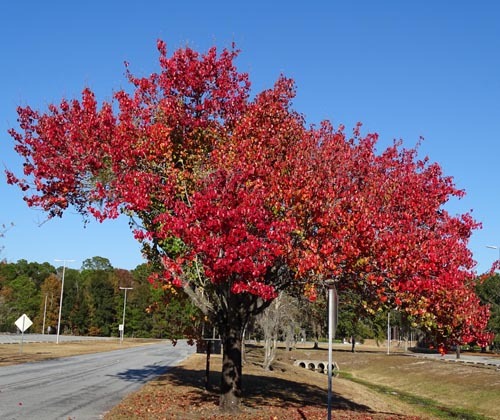 We literally followed the fall leaves from the Canadian Maritimes all the way to Florida (a few days later we did see some fall color in the Jacksonville area). We are happily camped in the first lakeside site, the one closest to the RV park entrance and office. We have a large yard with no other sites on our doorside. 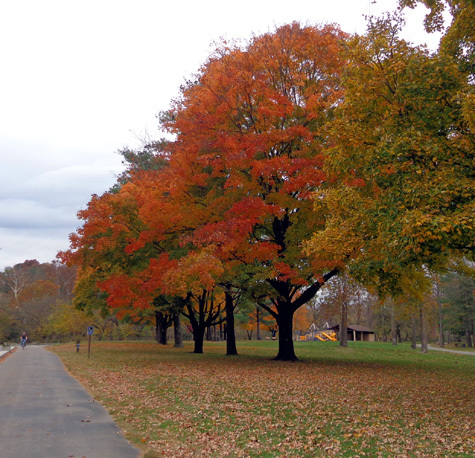 We can play "gatekeeper" all winter, watching people come and go (that has both advantages and disadvantages). There is plenty of room for both passenger vehicles at our site. The advantage of being close to the office is having a stronger WiFi signal. We can get the campground's free WiFi signal fairly clearly and our own MiFi signal (for secure transactions) even better. Our orientation is good, too, with the door facing east for morning sun. Trees shade the back of the camper to the southwest so we won't receive too much hot sun (if it gets hot, that is). We have 50-amp electricity, water, sewer, and cable TV for $570/month = $19/day. Sites that aren't on the lake are $1 less a day. 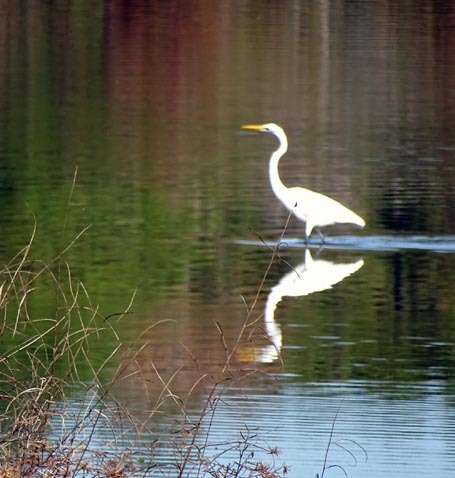 We like the lakeside sites best because the sites are larger and we can see more birds, boats, alligators, and views at the lake. 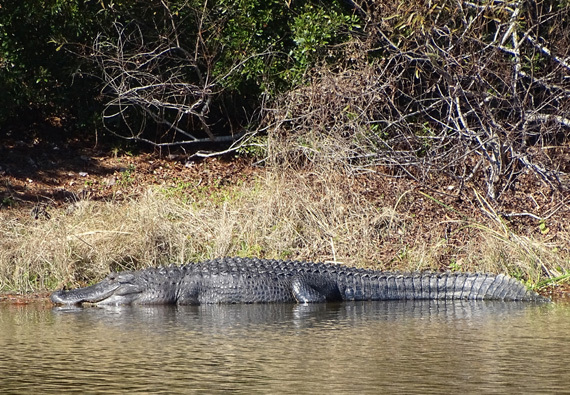 Their "grins" make alligators look happy as they bask in the sunshine. 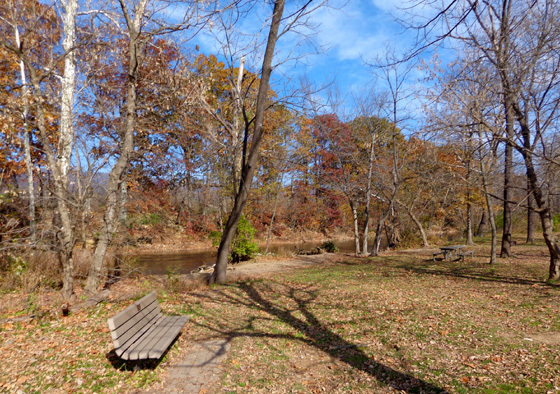 Our original reservation was for a lakeside site in December, January, and February. Because fewer people are here yet in November, we were able to come in ten days early. We will have to decide soon if we want to extend our stay at Kings Bay into March because the RV park is usually pretty full then. We can stay up to four months if we get our dibs in early enough. We're considering moving to one or two bases in Florida that are new to us in March but we need to do more research first. Stay tuned in 2015 to see where we go next!